The Council has voted the banning of the right turn from Lavender Hill into Falcon Road to be replaced with the introduction of right turn movements from Lavender Hill into Falcon Lane. The decision comes in the hope of easing the congestion at the crossroad between Falcon Road, Lavender Hill and St John’s Hill, beside Clapham Junction station. (k) two raised junction treatments in St. John’s Road. The Economic Development Officer comments that these proposals will make Clapham Junction a more attractive and prosperous town centre. As you can see in (h) they are talking about the relocation of the taxi-rank. Therefore that will occur with or without the Metro Fund’s proposal. That’s what I pointed out in comment 2 here, in response to Brendan (who is involved in helping explain and support the Metro proposals). (h) approve the development of a temporary traffic management plan so as to manage traffic during period of construction and to consult with the Cabinet Member and Ward Members on this plan. Therefore I wanted to have the views of the Councillors of the 3 Wards (Northcote, Shaftesbury and Latchmere) on the temporary traffic management they could envisage, assuming the major disruption that a 3 year construction proposal such as Metro Shopping Fund’s, will create. Tony Belton, opposition leader and Latchmere Cllr told me that their concerns (as opposition Cllr) won’t be taken into account by the Council). Cllr Paul Ellis and Cllr James Cousins, Shaftesbury ward, passed the hot potato matter to their colleague Guy Senior who must be on holiday (see UPDATE). Cllr Guy Senior as Cabinet Member whose brief covers this, and who is one of the Shaftesbury Councillors, will be better able to respond in full. 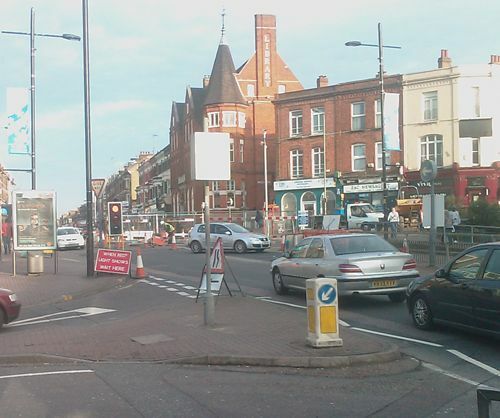 However, the roadwork changes are part of the Exemplar Scheme that aims to bring better order to the road system around Clapham Junction, for vehicles and for pedestrians – especially at the junction of Falcon Road/Lavender Hill/St. John’s Road and St. John’s Hill. 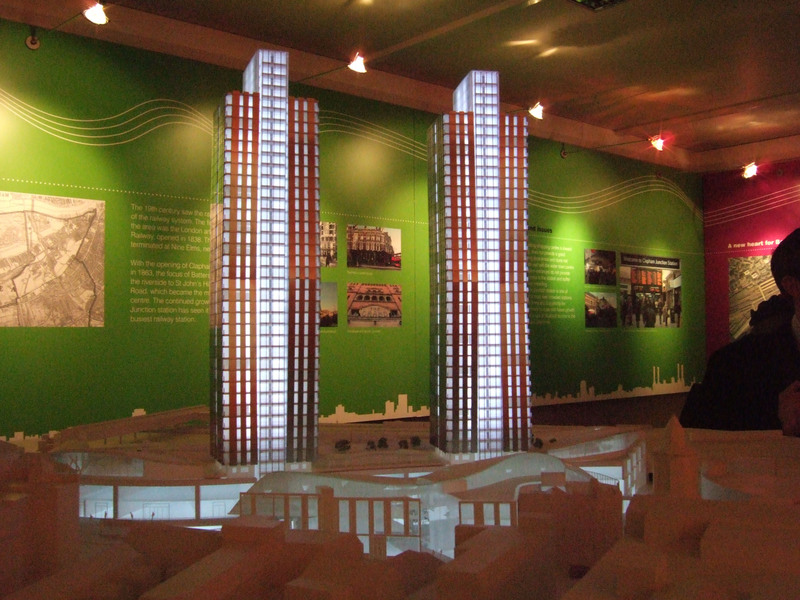 The scheme was developed ahead of any proposals for the development of Clapham Junction. I, and colleagues, and Council Officers have of course been very conscious of what the impact may be of both initiatives occurring at the same time. But since the timescale of any development of Clapham Junction cannot yet be determined it would have been unwise, perhaps one can even say irresponsible, to have waited on the result of the Metro Fund’s proposals before pushing ahead with the Council’s Exemplar Scheme. There has been widespread consultation on the Exemplar Scheme and much reporting of it – a Google search will provide a great deal of information on it. An added issue is the proposed wholescale redevelopment of the Peabody Estate on St John’s Hill, almost opposite Clapham Junction Station. If all three things were to occur at the same time it could cause chaos – I have raised this in fora where these matters have been discussed. Transport for London is a key player in agreeing and managing the transport challenges that could arise. They and the Council would clearly work very closely to reduce the possibility of unavoidable disruption. So, there must be some initial planning with regard to the Exemplar Scheme, and there must be some thoughts about the added impact of any proposed development at or around Clapham Junction actually starting, but the Exemplar Scheme is the only show in town that has a confirmed performance with curtains ready to be raised. It would be crazy for us to halt its commencement on the basis of what may or may not happen at Clapham Junction Station – but it would also be unwise of us not to factor that possibility into our future planning, as a ‘what if’ factor. I am copying this in to Guy Senior so that he may add to, correct or elaborate on what I have said. In the meantime, I trust that this response is of some help towards answering your query. I think it is important to note that the proposals that you refer to are not related to the planning application and can proceed independently of it. IF permission is granted for the development, it is the intention to construct it without having any general traffic diversions. However, there would have to be some temporary measures to allow vehicles in and out of the site and relocation of bus stops etc. This is just what happened when the site was last rebuilt in the late 1980s. If any road closures were needed on a temporary basis (e.g. to bring in large loads), then these would need to be agreed with the council. A construction management plan would also have to be agreed relating to such issues as times of work, noise, dust control and the like. Is Boris Johnson betraying those who voted for him and currently approving all schemes comprising huge towers? That’s what Simon Jenkins is writing in his letter to the Evening Standard, published on 24th February. “Johnson was apparently against these towers being “pepper-potted” across London. He was supported in this approach by the former leader of Westminster council, Sir Simon Milton, now his planning chief. He even encouraged the Standard to list the developments that would be doomed under his regime. As we have already commented here, last November, the Mayor’s office issued a planning report to Wandsworth Council giving a barely qualified green light to the Clapham Junction Scheme. The Mayor approved the design of the towers finding them “attractive city elements contributing positively to the London skyline” (since then, the Commission for Architecture and the Built Environment (Cabe) said that the buildings would appear “ungainly in medium and long range views of the buildings and unsettling when experienced up close” and the station entrance was also “under-played” architecturally). We were astonished by the comments, coming from the man who, before his election, vowed to put a stop to Ken’s ‘phallocratic towers’ and claimed that the previous Mayor was intent on ‘wrecking London’s skyline’. According to Michael Ball, Waterloo Community Development Group, he specifically promised to stop seven separate towers during his campaign, but has failed in every one and now actively supports three. No wonder why a lot of people in Battersea feel betrayed (including Simon Jenkins apparently): residents are clearly opposed to tall buildings “pepper-potted” across London (you can see a record of objections for the Wandsworth’s schemes) and it seems we live in extraordinary times when it takes a government minister rather than the Mayor for London to insist that national planning guidelines should be adhered to. One of the reason (maybe the main one) why local and central government are so accommodating to developers is not specifically a tendency for skyscrapers and high buildings, but the rack-off from development profits they can get. This is called section 106 agreement and means basically that in exchange of building whatever they want, they will pay for some Council’s duty (roadwork, affordable houses, etc). No wonder to see that after the Communities Secretary called for an inquiry into the Ram Brewery redevelopment voted by the Council in December. Edward Lister, leader of Wandsworth Council was so infuriated: all his plan for the one way system in Wandsworth Town to be redesigned and delivered free of cost for the Council by the developers is put in limbo. According to an article published in the Evening Standard tonight, Hazel Blears, the Communities Secretary, called for an inquiry into the Ram Brewery redevelopment voted by the Council in December. 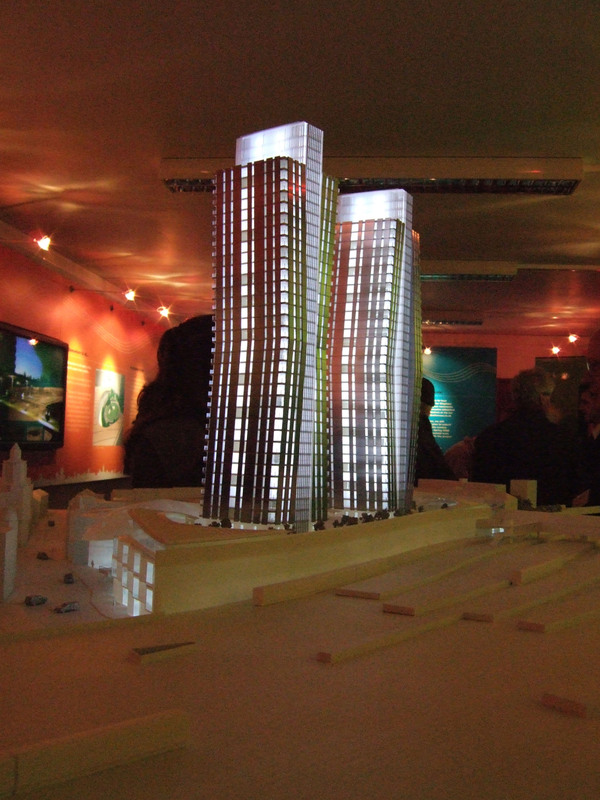 As we presented the consequences in a previous article, the main brewery site will be marked by a pair of 32 and 42-storey residential tower blocks (up to 145m or 475ft). The Planning Application committee voted by 9 votes to 2 in favour of the scheme. When outlining her latest decision, Ms Blears said “she ought to decide herself because she considers the proposals may conflict with national policies on important matters”. These include building heights, landscaping, hazardous installations (the site contains gas holders) and affordable housing. The Wandsworth application submitted by developer Minerva will now have to be considered at a public inquiry, with the final decision resting with her. The plans, which include 11 towers, including one of 42 and another of 32 storeys, had been nodded through by Wandsworth council in December. The letter in which Ms Blears spells out her reasons for calling in the development says her intervention was attacked by Wandsworth council leader Edward Lister. He said: “It’s unbelievable that in the depths of a recession we have a Government that would put at risk £1billion of investment in a suburban town centre. Mr Johnson supported the tower which, he said, met his requirements for the highest-quality design, and the traffic improvements. But Ms Blears said the application raised issues that went beyond the locality and had to be debated on the basis of national planning policies. Mr Lister said this was a waste of time and put the entire enterprise at risk. “The council set three main tests for the development, and the answer was yes on all counts”, he said. “The scheme is backed by the Wandsworth Town Centre Partnership, which described it ‘pivotal’ to their vision for the area. “It was also backed by the Mayor who said the tall buildings met his requirements for the highest quality design and confirmed that were no another means of funding the transport improvements needed.” Deputy mayor for policy and planning, Simon Milton, said: “The Mayor supports the Wandsworth proposal because of the major improvements it would bring. This decision by Ms Blears will delay crucial development in this period of downturn that will be damaging for London’s future prosperity.” However, he did not want to comment on the wider issue. Other proposals which could also be called in include the Victoria transport interchange and the Heart of Battersea development. You can also read our article about what the Mayor Office said on the Clapham Junction redevelopment proposal and his claim against tall building during his campaign. Welcome to our latest bulletin with reports on local issues including the extension of the East London Line, Heathrow expansion, the Clapham Junction planning application, the Bolingbroke Hospital and details of the next Safer Neighbourhood Team meeting. Please forward the bulletin to friends and neighbours in the area. Boris Johnson and Geoff Hoon came to Clapham Junction last week to announce the go-ahead for the East London Line extension. Really good news for Northcote ward residents that follows a lengthy campaign by the Council and local Conservatives to secure funding for the connection. 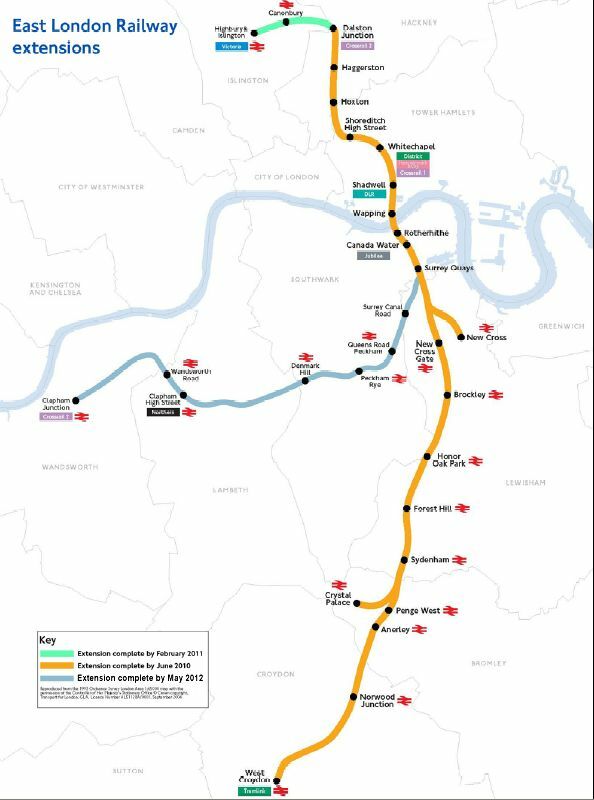 Read our article about the East London extension here. Use it to check out what is happening along Northcote Road . Read our article about business in CJ here. Thank you to everyone who has let us know their views about this planning application – it is probably the most important to affect Northcote Ward in a generation. If you have not yet submitted your views to the Council’s Planning department please do so as soon as possible. All three Northcote councillors spoke at last month’s public meeting organised by the Clapham Junction action group – see reports posted (17th February and 29th January) on the action group’s website www.towerscj.wordpress.com. At the meeting we explained that we continue to ask questions about a number of key aspects of the scheme including the impact of two 42 storey towers on the surrounding area much of which is designated a Conservation area; the real nature of the station and platform improvements and Network Rail’s plans; the need for a proper transport interchange including bus facilities; the implications for air pollution in the area and the mix of the proposed development with its focus on small flats and retail outlets with the loss of other employment opportunities. Jane Ellison, Battersea’s Conservative Parliamentary candidate, has issued a Residents’ News opposing this application – go to www.janeellison.net and scroll to Latest Campaign – Britain’s Busiest Station Deserves Better. Details of the proposal are available on the developers, Metro Shopping Fund, website www.theheartofbattersea.co.uk. Go to Latest News to see their current leaflet (the beat 03). Full details of the applications and comments submitted so far can be seen on the Council’s Planning website search the planning register and enter application number 2008/4488. The following links will take you to a recent exchange of letters between the Council’s Planning Department and Network Rail, both are posted on the Planning website – they are well worth reading. The following link will take you to a letter that the Council’s Planning Department sent to the developers last month. We understand they are preparing a comprehensive response. As we said at the public meeting we will ensure that the views of Northcote residents are properly represented when the application is discussed at the Planning Committee and at any full Council meeting so please do let us know what you think of this application. Read our report on the meeting here and watch the videos there. See our analysis on the letter sent by Wandsworth Council press officer: Planning Decision Deferred Again! Our comment about Jane Ellison’s statement is here. The day of our Public Meeting that they refused to attend, Metro Shopping Fund (the joint venture between Delancey and Land Securities) distributed a leaflet on their proposal, answering some questions. You can read the PDF version here. We welcome the initiative to communicate on the planning, although we found some gross misleading all along the document. We thought it was worth commenting (in brown) some extracts (in green) of the brochure bellow (for full quote and page number, please refer to the PDF document above). A) With this, the developers are associated the lifts to their improvement efforts. This is a false representation; in reality the lifts are currently put in place on Brighton Yard entrance (opening at the end of the year) and their cost of about £9 millions is paid by the government (as Martin Linton said: “contractors are installing 9 lifts at Clapham Junction station as part of the Government’s £370 million Access fo All scheme. The Brighton Yard entrance at the top of St John’s Hill will be re-opened with a ticket office to provide direct access to the overbridge and the lifts“). B) Actually the truth is that by the end of the year, we will have 3 entrances to CJ station: a main one in St John’s Hill, Brighton Yard and Grand Road. The developers plan is proposing to close the main one. Therefore I find it difficult to imagine how it can make things easier for passengers. In addition, experience in Redhill shows that closing the entrance to the under-path to use the over-bridge only was a mistake and they are reversing to original now. C) Misrepresentation again as the straightening and lengthening of the platforms are part of Network Rail Strategic Plan since 2006… nothing to do with Metro Shopping Fund. A) As a local resident recently emailed me: “Clapham Junction station definitely needs serious improvements, and the reasons for this have been well rehearsed. However, it must surely be the responsibility of Network Rail to carry out these improvements. We have a major London station here, and it is a disgrace that we should rely on a trade-off with private developers to provide what should be expected as a matter of course from the rail network company. It is incumbent on Wandsworth Council to work with the Company to ensure that the upgrade of the station is carried out to a standard befitting one of the most important transport hubs in the country. Spending time, money and energy on considering the building of two tower blocks is not the way to deal with improving our station. ” I could not say it better. B) As we wrote back in November, the present proposals are nothing more than an opportunity for Network Rail to save money by joining forces with a commercial developer whose sole interest is to maximise the retail and letting potential of the site to the detriment of the local community and rail passengers. During our Public Meeting in January (which Delancey refused to participate to, saying that “public meeting forums are not the best way to discuss elements of the scheme“), Cllr Philip Beddows talked about the necessity to have “somewhere where you actually love to be and can be proud of, rather than an environment that can be replicated anywhere […] we need to consider the legacy that the decision will leave on the people who will be living here beyond us“. I don’t think he was suggesting that the current proposal was a greater benefit for the community and that all wise taxpayers are NIMBY. C) Er, what about the the increased walking distance across the over-bridge compared with the shorter distances along the tunnel? C) “Why must Clapham Junction station be improved? Clapham Junction is Britain’s busiest railway station. […] Metro Shopping Fund’s investment at Clapham Junction is vital, otherwise these improvements will not be delivered for the foreseeable future. A) Mark Hunter, the Council’s Planning Officer, highlighted in his letter to the developer that there was actually no consideration given to the station’s position as a major rail/bus interchange. Longer walking distances to the bus stops on Falcon Road and insufficient capacity around the bus stops for people waiting. Is it what metro called “working with TfL and the Council“? C) We cannot disagree on that. CJ needs a redevelopment, definitely. But as we explained here, the best way to get the station improved is to refuse the planning permission. A) Question here is simple: is Metro Shopping Fund lying, do they hide their head in a hole or do they just ask the relatives of their shareholders their opinions? Truth is that there is actually an overwhelming support against their proposal, as shown here. In addition, do I need to remind you – again – that they refused to participate on the platform to our Public Meeting, on the basis that “public meeting forums are not the best way to discuss elements of the scheme“? I today received yet another misleading pamphlet through my door trying to garner support for the monstrous twin tower block proposal for Clapham Junction. I am extremely disturbed at the misleading way the pictures in this pamphlet have been rendered. It is clear to me that they do not show the true nature of the proposed buildings and I’m very fearful that the pamphlets will persuade people to support the application and be horrified when they see how it genuinely turns out. I fully support the idea of regeneration of Clapham Junction, but we MUST reject this proposal and find an alternative that will not ruin Clapham Junction’s character forever. Please reject the proposal urgently so we can work towards something more constructive and more aesthetically appropriate! I have already written to you once before about the proposed redevelopment around Clapham Junction and understand that there are much needed access and accessibility issues around the station which have been over due for years, but this being tied in with the development of two 42 story tower blocks is inappropriate. I work in the creative industries and have an interest in the build environment, and do not have a problem with modern buildings but they need to be suited to their local and other properties/buildings in the vicinity, plus the surrounding landscape. These are an eyesore in the local area in terms of complimenting the existing building, disregarding their height which again does not fit with the other buildings. I attended a public meeting on Wednesday 28 January which was interesting and informative and it was great that there were some local councillors in the audience. The following day I received some material through my later box from Delancey/Land Securities promoting the development and requesting residents to agree to it, the material was very misleading, both in terms of the image and content. I am writing with regard to the planning application for the Metro Shopping Fund development at Clapham Junction. There seems to me to be three clear, separate issues to this proposal: the up-grading of Clapham Junction station; the two 42 storey skyscraper buildings and the shopping and general improvement of the Clapham Junction area. Somehow, perhaps because of the funding of this development, they have been presented to us, the residents, as interdependent. Certainly, there can be no dispute that Clapham Junction station is in urgent need of improvement but does that mean, therefore, that the developers can ask and draw-up plans for a scheme, that would appear to go against all the guidelines to town centre planning? Furthermore, that the planning officers have allowed, and may even recommend, a development of this scale purely to precipitate the station up-grade. In the current issue of your Brightside magazine, Guy Senior, commenting on the improvements proposed for Earlsfield station says: “We’ve got to keep the pressure on Network Rail to deliver these improvements”. I’m sure Earlsfield, along with many other stations in the Borough – Battersea Park Road, for example – are all deserving of an up-grade but none carry the volume of commuters that Clapham Junction does. What pressure is being applied to Network Rail on behalf of Clapham Junction and shouldn’t it take precedence? The two skyscrapers will stand so far above the existing buildings in the area and totally dominate the skyline. There is no green space, or open space at the Junction. It is just that. A major traffic junction: 240 buses an hour, I read, pass through, plus cars, taxis and people on the pavements. It is over congested now and the sheer density of this scheme: 1,000 people, 290 car parking spaces in an area already bursting will make it worse. Why? A few hundred yards up St. John’s Hill the old Gala bingo hall is being developed for housing; opposite there is an infill block of flats and opposite that the old pub site is also being developed. Then of course further up the road there is the newly approved Ram Brewery development of 1,000 new homes. Is there really the demand for all these apartments? Families with young children will not want to live 42 stories up overlooking the country’s busiest train station and young single people will not be able to afford them? What also of the regard for the surrounding buildings? The architect talks of the Grand theatre opposite the station, there is the listed Falcon pub and Debenhams store on the opposite corner. All buildings of period architecture and completely at odds with the proposed shiny huge towers. Shopping at Clapham Junction has been in decline in recent years, the developers say. As the council has always been keen to promote the Arndale centre to the detriment of Clapham Junction, is that surprising. The Northcote road thrives as does Battersea Rise with all the restaurants. Now with Waitrose and other new shops opening, St John’s Road is slowly improving. Why then, for example, does the Council permit another betting shop to open on Lavender Hill when there are already two others in the immediate area? It is difficult to understand, given the weight of all these arguments, that this scheme should be given the go-ahead to be developed or even have been considered in the first place. I would welcome your comments.